Recently I bought a t-shirt from Death Spray Custom, http://blog.deathspraycustom.com/ . The t-shirt arrived promptly, and within its folds was this sticker! !, now as I said to Mr DSC in an emither, it really is very sad the a nigh on 40 year old, (next year), gets overly excited aboot a little square of self adhesive vinyl, but I did/ do. 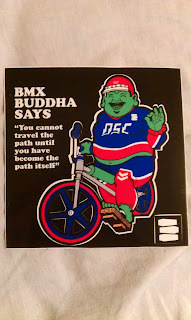 The BMX Buddha has always been in the borders of his blog, and low and behold, I'm now the proud owner of a copy, its almost too good to use, (nothing is worthy of its placement, its up there with the Mambo sticker of a dog lighting its own fart!!). I think when I get my bike back on the road, I may ask Mr DSC if he'll paint BMX BUDDHA on my lid, who knows.